Hunting for new and exciting boneless chicken breast recipes never gets old to me. I would say that in an average month, we try 4-5 new recipes involving the “plain Jane” of chicken pieces but because you’re not seeing 4-5 new chicken recipes here each month, you can safely assume that most of them are not, in my overly selective eyes, worthy of sharing with you. 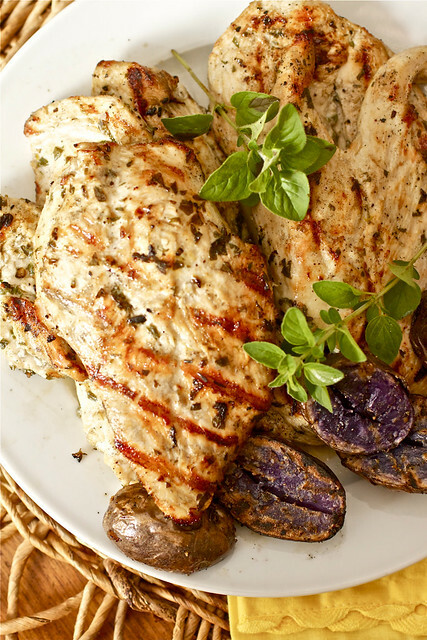 And then along came this grilled Greek chicken recipe. I was smitten at the word “Greek.” Though you may have already guessed that from my professed infatuation for feta cheese. Maybe to your dismay, this post isn’t about the feta though. It’s about the chicken and after tasting this chicken, you may understand why I forgot to put the feta in the cucumber tomato salad (whoops). 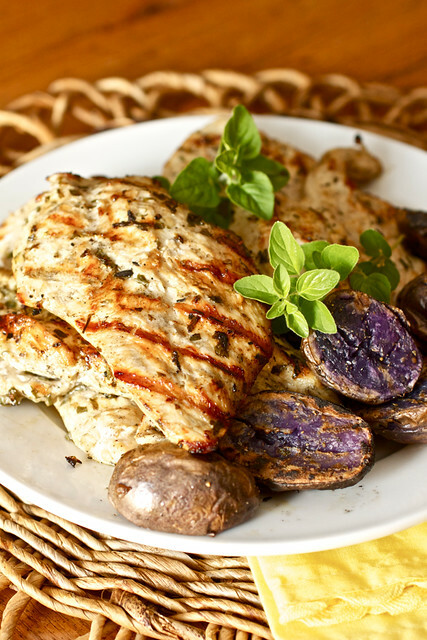 The chicken really has a chance to cozy up with a marinade of bold citrus, a generous amount of garlic, and a handful of garden fresh herbs and after 48 hours in this marinade, the plain Jane chicken breast emerges as a Greek goddess. It’s true. The chicken is transformed and I can guarantee that, upon being grilled, you will not end up a with a dry piece of chicken. The marinade penetrates itself into the chicken breast (after 48 hours in a plastic bag, it needs somewhere to go! ), leaving the chicken fork-tender and dripping with the earthy flavor of the garlic and fresh herbs. Overall, I’m thrilled at having found this recipe and I know it’s one that I’ll be excited to keep in our rotation. And next time, maybe I won’t be so distracted by this glorious chicken that I’ll remember the feta. In a medium-sized bowl, combine the first 6 ingredients. Whisk in the olive oil until well combined with the other ingredients. Place chicken breasts in a large resealable zipper bag and pour marinade over the chicken. Close the bag, taking care to remove as much air from the bag as possible. Smoosh (technical term) the chicken breasts around in the marinade until all of the chicken is covered with marinade. Place the bag lying flat in the refrigerator for 24-48 hours – the longer the chicken marinates, the better it will be. Take note that when you marinate your chicken for this long, it should be as fresh as possible – don’t use chicken that is at its sell-by/use-by date already. Every 12 hours or so and without opening the bag, smoosh the chicken around in the marinade to reposition it, then return it to the fridge. When you’re ready to grill, allow the chicken to sit at room temperature for 10-15 minutes before grilling. Set the grill to medium-high heat and place the chicken over the heat source. Grill chicken to an internal temperature of 165 degrees F, about 4-6 minutes per side, depending on the thickness of the chicken breasts. Once cooked, remove the chicken from the grill and allow it to rest for 5 minutes (covered) before serving. This sounds wonderful. I eat chicken pretty much every day, so I always want new flavors to try! I starred this before even reading the post! YUM! Yum, this is right up my ally! Totally trying this soon! Yummy. I love grilled chicken and anytime you throw fresh herbs in the mix you know it’s got to be good. 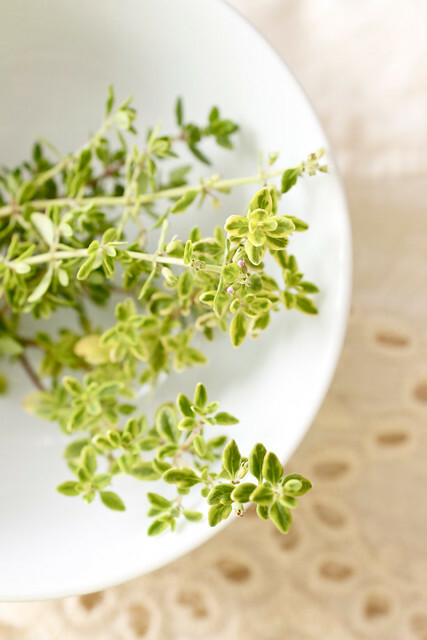 Great herb combination. Those are my four favorite! Yum, this chicken looks so tasty! Perfect for a summer evening, yum. I started marinading this yesterday morning and cooked it for lunch today. It was really delicious, though did anyone else notice that when they were marinading the chicken breasts they started to look as though they’d been cooked? I looked it up and it turns out that when you use lots of lemon in a marinade, the citric acid starts to nature the proteins in the meat (which is what happens when you cook something) and change the texture and appearance to that of cooked meat. How weird is that?! Thanks for the recipe though, it was absolutely amazing and I learned something new. Yummy! I enjoyed this recipe. This was filed in my recipe file too.